24 JanBattle of hearts – two ladies fight for the heart of a count. “Battle for Hearts” is a composition by Bert Appermont. In this work is a source of inspiration Heinrich von Kleist’s theater piece “Das Käthchen von Heilbronn”, written in 1810. The music recalls the underlying drama, tensions and emotions of the characters involved: “The Blacksmith’s Daughter”, “Kunigunde”, “The Fire” and “The Emperor’s Daughter”. The title Battle of Hearts refers to the two ladies of the story (Käthchen and Kunigunde), who both fight for the heart of the “Count of Strahl”. It is an impressive, not programmatic, but very thematically influenced work that is suitable for concerts and competitions. This composition gives its name to the current CD of the Swiss National Youth Wind Orchestra. The orchestra consists of around seventy highly motivated young musicians, a competent conductor and a professional team of register teachers. These guarantee the achievement of the musical goals. The orchestra organises itself in the course of an annual training week and performs as a sympathetic calling card for Swiss youth music with high-quality concerts and selected music programmes. 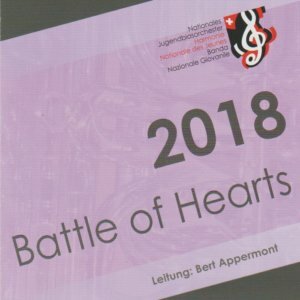 The musical director of this CD is Bert Appermont, who has recorded further compositions by Ottorino Respighi (Pini die Roma), Mario Bürki (1405: Der Brand von Bern), Etienne Crausaz (Balkan Dance), George Gershwin (An American in Paris) and JohnPhilip Sousa.